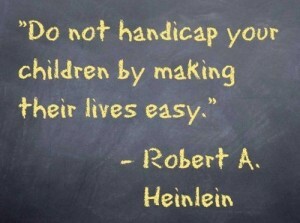 Just to remind you-in my last blog I talked about helicopter parents. Helicopter parents earned this nickname because they seem to ‘hover’ over their children in an effort to control their lives and protect them from harm, disappointment, or mistakes. Not only are these parents concerned for their children’s safety, but they attach their own self-worth and identity to the accomplishments and successes of their children. I was naturally curious about what these children were like when they grew into teens, a natural time to begin separating from your parents and begin taking more responsibility for yourself. Researcher and psychologist, Neil Montgomery conducted a study on 300 college students at Keene State College in New Hampshire and similar studies were conducted at Wollongong University in Australia. According to these studies the negative effects of ‘helicoptering’ tend to make children experience low self-esteem, difficulty handling crisis and emergencies, significant levels of anxiety, a deep sense of entitlement, and a lack of life skills. In other words, these kids have trouble problem solving and thinking on their feet. Allow Children to Make Their Own Decisions: They will come to realize that their life is a result of the choices they make rather than the ones you make. Allow Children to Feel What Responsibility Is: Even if a task is not done ’perfectly’ resist fixing it or doing it for them. This trust in your child fuels your child’s sense of ‘I can’ and build’s self esteem. Allow Children to Make Mistakes: And be okay with those mistakes! Mistakes are a natural step in self discovery and independence. Prepare Children to Handle Risks: Preparation is much more effective than overprotection because it teaches children to function in the real world. Empower Your Children to Discover Who They Are: Let your children experience the power of responsibility, teach them to make choices, allow them to solve problems, leading them to experience the powerful feeling of ‘I can.” This will pave the way for your children to discover their own identity!